There’s a problem with our conception of progress in America today. It’s based on money measures and not much else. Measure of America creates metrics to tell us about how people are doing. One fundamental indicator of societal progress and well-being is how young people are faring in their transition to adulthood. And on this measure, 4.9 million young people are falling behind. Disconnected youth are teenagers and young adults between the ages of 16 and 24 who are neither working nor in school. There are 4,881,500 disconnected youth in America today, or about one in eight teens and young adults (12.3 percent). Since Measure of America first wrote about youth disconnection half a decade ago, public awareness of both the plight and the promise of young people who are not in either school or the workforce has grown by leaps and bounds. Today, fewer young people are disconnected from school and work today than were before the Great Recession. But challenges remain: 4.9 million young women and men are still disconnected from the educational and employment opportunities required for rewarding, productive lives. 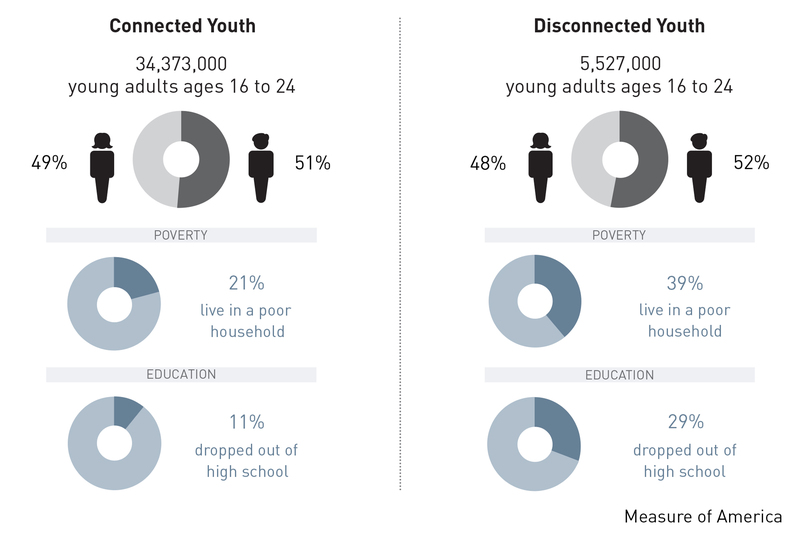 Until Measure of America began analyzing the disconnected youth population in 2012, these data were not available. This research is essential to provide policymakers, business leaders, philanthropists, community leaders with the up-to-date data they need to target and tailor their interventions and assess the effectiveness of their efforts. 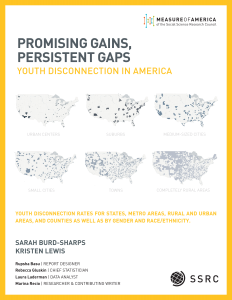 Measure of America has produced three national-level reports on youth disconnection, most recently in March 2017. Overall. In 2015, 4.9 million young adults between the ages of 16 and 24 were disconnected—12.3 percent of American youth, about one in eight. This is a significant drop from the post-recession high of 14.7 percent, over 5.8 million youth, in 2010. Rural-urban divide. 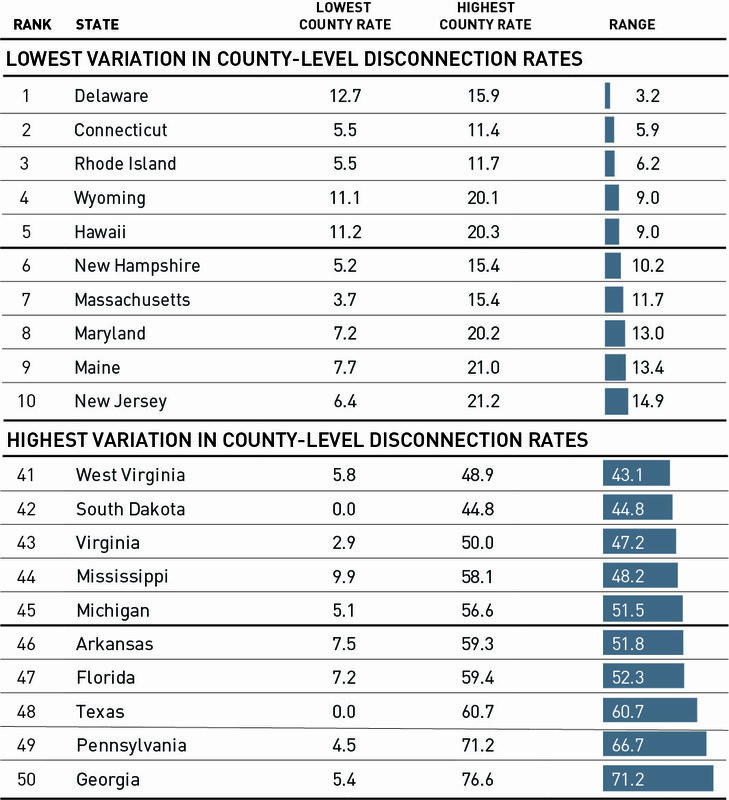 This research shows that rural counties as a whole are faring considerably worse than more populous counties in terms of youth disconnection. 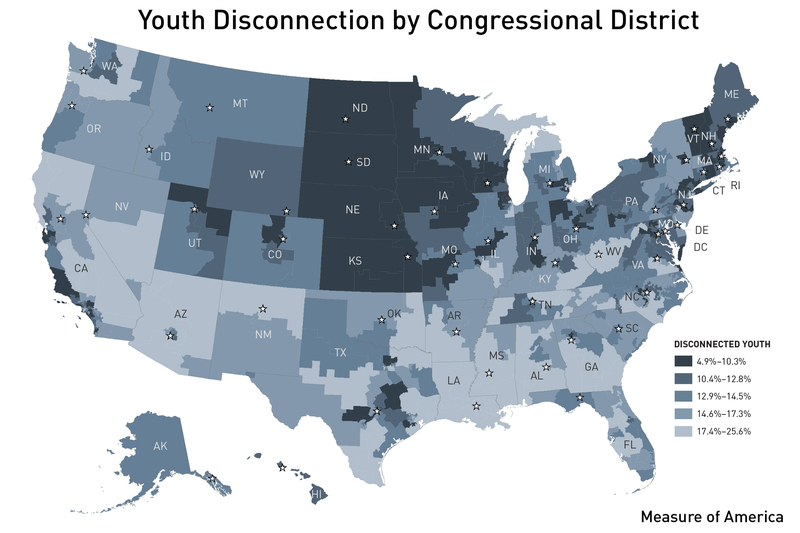 In completely rural counties, the youth disconnection rate is 20.3 percent, much higher than the rate for counties in urban centers (14.2 percent) or for suburban counties (12.3 percent). Rural counties in the South have a particularly high rate: 24.0 percent—double the national rate. Race and ethnicity. 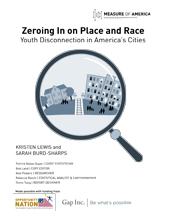 There is astonishing variation in disconnection rates by race and ethnicity, ranging from nearly one in fourteen Asian American youth to more than one in four Native American young people. 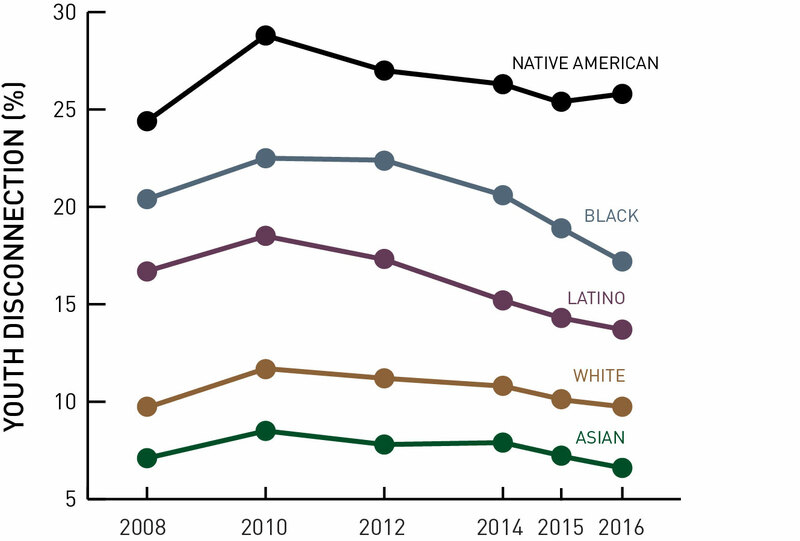 The Asian American youth disconnection rate is 7.2 percent; the white rate is 10.1 percent; the Latino rate is 14.3 percent; the black rate is 18.9 percent; and the Native American rate is 25.4 percent. 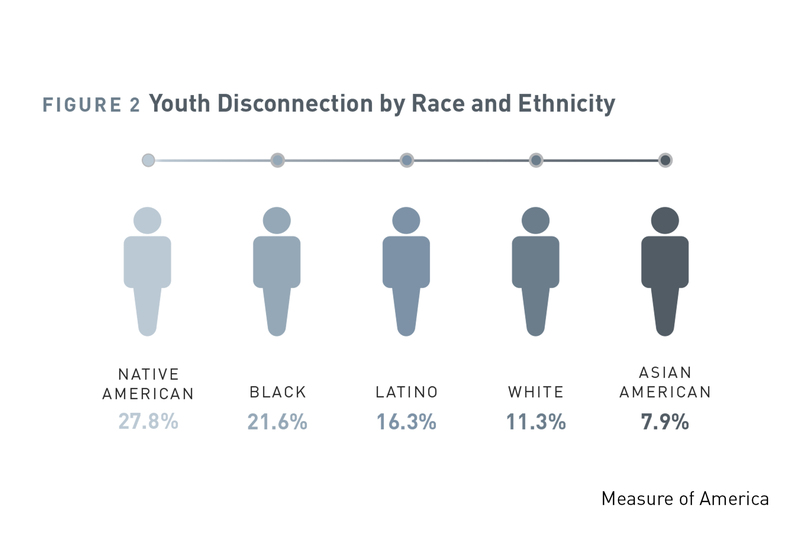 Though the rate varies among Asian subgroups, most are performing well on this indicator; only Hmong Americans have a rate of youth disconnection that surpasses the US average. Women and men. Nationally, girls and young women are slightly less likely to be disconnected than boys and young men, 12.0 percent vs. 12.5 percent, a small but statistically significant difference. The difference in youth disconnection rates between genders plays out differently for each race or ethnic group. States. 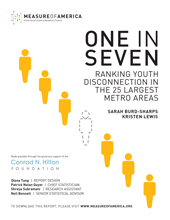 Young people are disconnected at rates that range from under 8 percent in some states (New Hampshire, Nebraska, North Dakota, Vermont, Minnesota, and Iowa) to over twice that in others, with New Mexico (17.4 percent), West Virginia (17.0 percent), and Mississippi (16.7 percent) facing the greatest challenges. Black-white gaps. 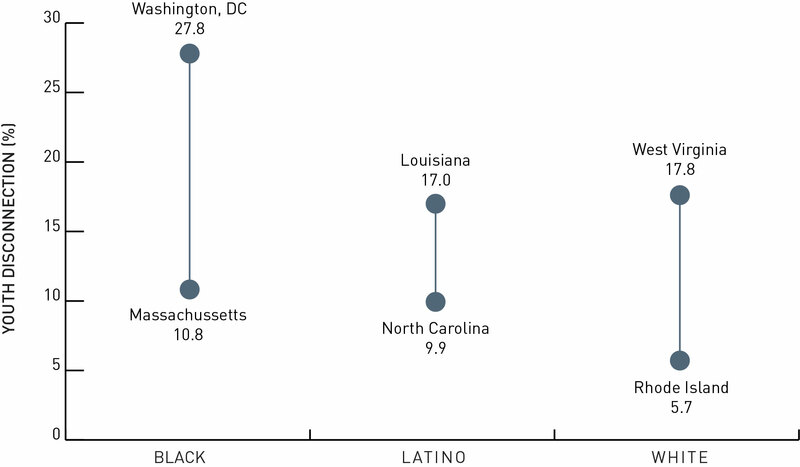 Measure of America calculated the disconnection rate for blacks, Latinos, and whites at the state level when data allowed. The black-white disparity is so stark that even in states where white youth are faring the worst, they are still doing better than US blacks on average, and even in states where blacks are faring the best, they are still not doing as well as US whites on average. Top and bottom metro areas. 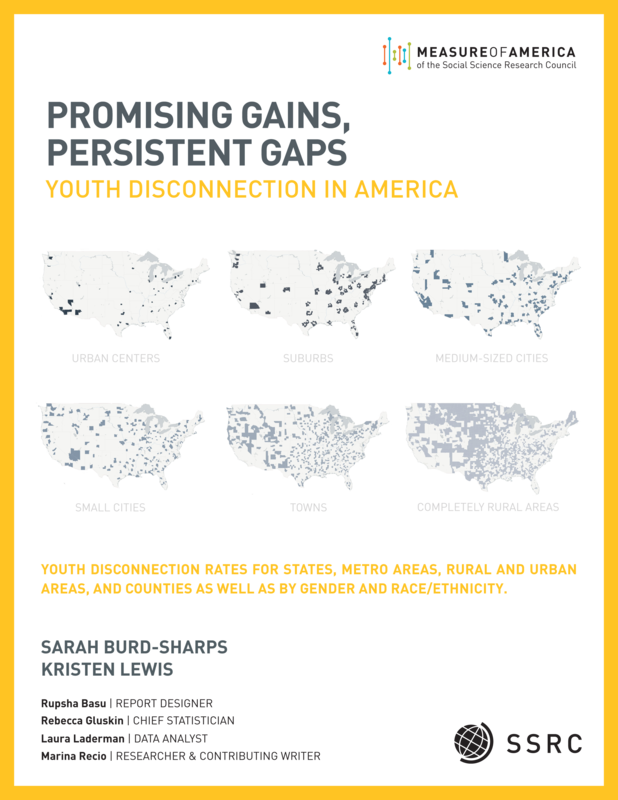 Among the country’s ninety-eight most populous metro areas, greater Albany, NY (6.5 percent), Grand Rapids, MI (6.8 percent), and Omaha, NE-IA (7.1 percent) had the lowest youth disconnection rates. The Bakersfield, CA (18.7 percent), McAllen, TX (19.7 percent), and Augusta, GA-SC (21.0 percent) metro areas had the highest rates. Impact of poverty. For young people of all races, the probability of disconnection falls as household incomes rise. White youth in affluent households are less likely to be disconnected than white youth in poor households, and the same is true for the other racial and ethnic groups; however, blacks, Latinos, and Native Americans are more likely to be disconnected than whites and Asians given the same income level. In fact, the rate of youth disconnection for Asian Americans in households with almost no income is the same as that for black youth in households with incomes close to five times the federal poverty line. 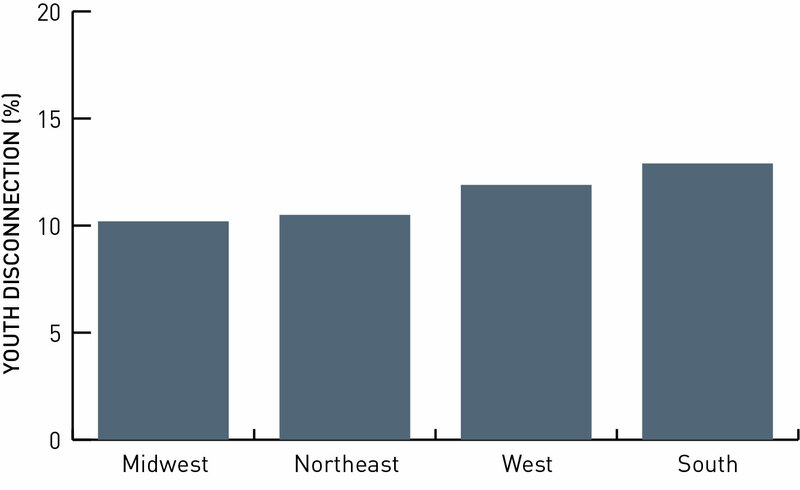 Native American youth living in households with incomes at five times the poverty line face roughly the same probability of disconnection as white youth living in households with incomes well below the poverty line. Biggest improvements. 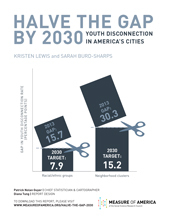 Between 2010 and 2015, Washington, DC made the greatest progress, with a 43.9 percent reduction in the rate of youth disconnection. New Hampshire had the second-largest drop, nearly 32 percent, and now has the lowest rate of any state.